If you have an employee awards ceremony coming up or simply want to show your appreciation, blown glass awards from Awards.com make a meaningful impact. These colorful custom glass awards come in a variety of shapes, sizes, and designs, and each one includes free logo, engraving, and proof so you receive the exact order you're looking for. A hand-blown glass award from Awards.com is impressive and elegant. Recipients will love displaying these custom glass awards in their home or office, and anyone who sees these glass awards will associate their refinement and exceptional quality with your brand. Glass awards from Awards.com sparkle from a stage and wherever they are displayed. You can choose from designs including geometric shapes, abstract designs, animals, or even apple awards that are per-fect for teachers and school administrators. You can also create an award trophy with your own design here. Each glass award is made from the finest materials by our talented artists. These awards make your display of gratitude remarkably significant. Browse our most beloved and popular designs below and see our other glass award options here. Many come in a variety of sizes, so it's easy to order more than one at an affordable budget. Have ques-tions are you're browsing our glass trophy awards selection? Call us at 1-800-4-AWARDS to talk with one of our team members. 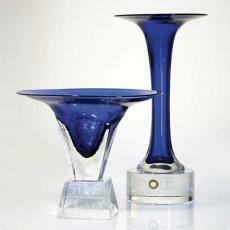 We're here to help you choose glass awards you'll love giving and that recipients will treasure. 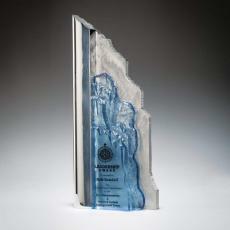 Beautiful and sturdy, art glass awards make any office look like an executive suite. 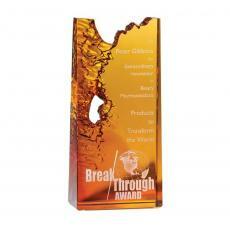 Made of hand blown glass, these trophies make any occasion or recognition special. Whether you’re commemorating years of service, exceptional leadership, or retirement, these artful sculptures are an elegant way to show your appreciation to employees, colleagues, or volunteers. 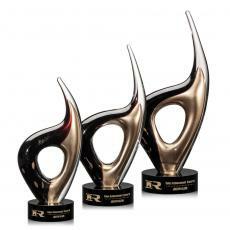 Made of high-quality blown glass or top-grade crystal, these trophies can be shaped into different forms. Awards.com features sculptures of animals, geometric or abstract forms, and even apple awards for your favorite teacher. 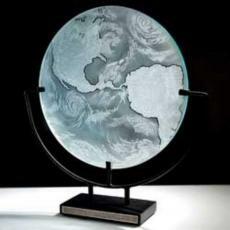 Engraved art glass awards give recipients the recognition they deserve. You can personalize every glass sculpture with names, logos, and award titles. For complex designs, you can upload a Word or Excel document to ensure your message comes through clear. We also have three fonts to choose from for engraving the base of the glass award. 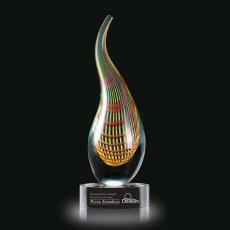 Promotional glass awards come in high-end artistic designs from craftsmen who use the best technology and materials. 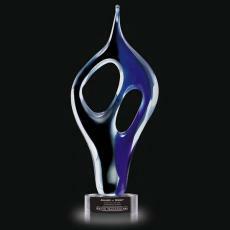 When you give employees art glass awards, you are commending them with a sculpture that will last a lifetime. $68 - $80| Sizes: 4.5"
$175 - $225| Sizes: 12", 14" & 7"x16"
$158 - $190| Sizes: 5.5"x6", 5.5"x8.5", 7"x7.5" & 7"x9.5"
$86 - $98| Sizes: 7.5"
$68 - $81| Sizes: 5.5"
$66 - $79| Sizes: 5.75"
$74 - $215| Sizes: 11", 6.5", 8" & 9.5"
$995 - $1,595| Sizes: 12"x10.5" & 8"x16"